BERTIN the YOUNGER, not to be confused with his name sake St. Bertin (5th September), St. Bertin the Younger was also a monk at the Abbey of St. Peter (later St. Bertin) in Sithiu (present-day Saint-Omer, France), who reposed circa 699. FELIX of SEVILLE, (Date Unknown), a deacon who was martyred in Seville, of whom nothing further is known. GERMANUS, described in an early Life as “Scotus”, St. Germanus was most likely a native of Ireland. It is said he was converted to Christianity by St. Germanus of Auxerre (31st July) during the latter’s visit to England. Taking St. Germanus of Auxerre’s name, St. Germanus travelled to Normandy, where preached the Gospel to the natives. He was martyred for the Faith in Normandy circa 460. NEACHTAIN, (Fifth Century) St. Neachtain was a close relative of St. Patrick of Ireland (17th March), and is traditionally believed to have been present at his repose. Nothing else is known of this saint’s life. ULTAN, the brother of SS. Fursey (16th January) and Foillan (31st October), and a monk with them to Suffolk in England. St. Ultan then went to present-day Belgium where he founded an Abbey near Liège. Finally, he settled at his brother St. Fursey’s Abbey at Péronne in the Somme Valley, where he succeeded his brother as Abbot, serving until his repose circa 686. VALENTINE, an early Bishop of Genoa, St. Valentine served the See from circa 295 until his repose in 307. 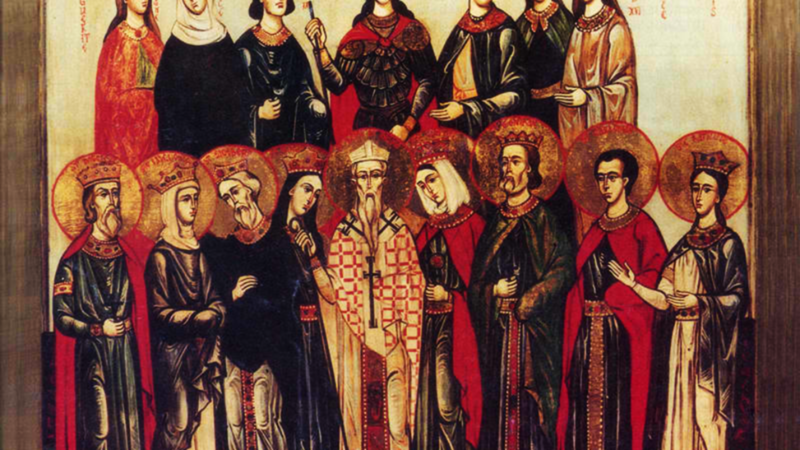 VINDEMIALIS, EUGENE, and LONGINUS, three bishops in North Africa and fierce foes of Arianism. All three were subjected to torture and then martyred circa 485, by order of the Arian Huneric, King of the Vandals (r. 477–484). WALDEBERT (WALBERT, GAUBERT), monk and later Abbot of the Abbey of SS. Peter and Paul of Luxeuil. St. Waldebert assisted St. Salaberga (22nd September) in founding the Abbey of Saint John the Baptist in Laon, Francia. St. Waldebert reposed circa 668. WIBORADA (GUIBORAT, WEIBRATH), a Swabian noblewoman who, following the death of her parents, became an anchoress not far from the Abbey of St. Gall in the present-day Swiss city of St. Gallen. St. Wiborada reposed in 925.